Alessia Thomas Jackson of Haverhill has once again raced to success in the skiing world. Pure blue skies, blistering temperatures, and two ripping courses set along 200 metres of rumbling dendix were all that separated the nation’s best young skiers from realising their hopes, dreams and aspirations in the 5th and concluding Inghams sponsored Grand Prix of Summer 2008. In the female race, previous winners Rachel Adcock and Emily Evans slugged out two runs of genuine heavyweight proportions for the victory spoils. In third place finished Haverhill's Alessia Thomas-Jackson, who, with the whole series in her hands, produced one of the gutsiest runs of 2008, risking everything in search of the few tenths of a second she needed to turn the screw on Evans and Adcock. Alessia won the OVERALL FEMALE SERIES WINNER, becoming the youngest ever winner at 15 years old! And so the final Grand Prix of the season had produced yet another stunning race for 2008. 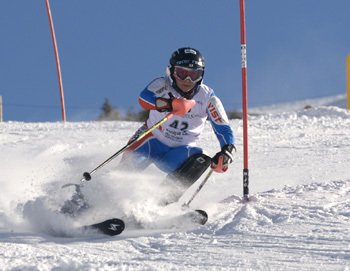 Alessia, who attends Haverhill's Castle Manor Business & Enterprise College when she is not training and racing in Austria, already holds a clutch of ski titles including Welsh Alpine Overall Female Giant Slalom Champion 2008 & English Alpine Overall Children Giant Slalom Champion 2008.